Yeah I bet her insurance loves her lol. It's interesting, but when I rented a 997 Turbo in Dallas a few years back, my insurance company had to verify in writing that they could cover the cost of the car. I also had to put a $15k deposit on my credit card. But it was worth every penny. Nothing in Monte Carlo is understated, from the baubles to the yachts to the bank accounts. Now add traffic pile-ups to that list. The Hope Diamond of fender benders unfolded yesterday in possibly the most conspicuous stretch of asphalt in the .75-square-mile principality — the round-about in front of the James Bond-worthy casino — when three blondes in a jelly-bean blue Bentley Azure ($363,000) scraped the rear of a white Mercedes-Benz S-Class (a paltry $91,000). And that was merely the appetizer. Served up for the main course were a hapless black Ferrari F430 ($186,000), which was hit nose-first by the 2.7-ton Bentley. Then, like two tankers mashing in the fog, a four-door Aston Martin Rapide ($228,000) crunched into the Azure’s passenger door. The cherry on this metal, plastic and carbon-fiber shattering souffle: a stray Porsche 911 ($77,000). In all, a Titanic mess in mere moments, involving nearly a million dollars of primo automotive machinery. How did this happen? A quick photo-based forensics of the scene based on knowledge of the Place du Casino offers many clues. 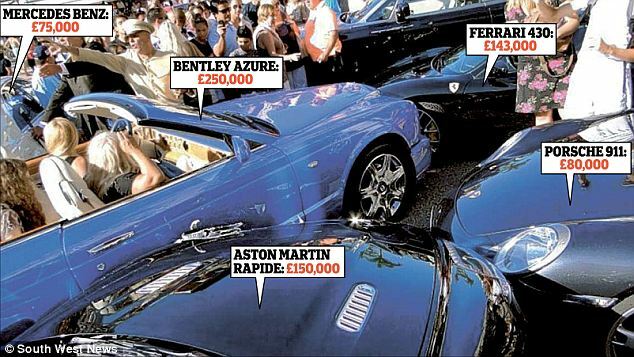 What’s evident is that these five vehicles did not all converge on each other in one massive supercar big bang. The Bentley clearly was at fault. Its nose is pointing straight at the casino’s entrance, an entrance where fine cars are routinely valet-parked diagonally. It seems that the Bentley’s driver thought she could sneak past the white Mercedes, then swerved right when she realized they were going to collide, which in turn clipped the Rapide coming up on her right. The Ferrari and the Porsche were collateral damage - parked directly in the Bentley’s now diverted path. Any chance that the trio responsible for this mess — whose damage tally will easily hit six-figures — would get to scamper off anonymously after a quick chat with Monaco’s famously efficient and ever-present white-gloved police were dashed given both the coordinates of the crash and the time of year. If there ever was a season when this moneyed retreat is more crowded than Times Square on New Year’s Eve, it’s summer. Photos of the crowd, gleefully gawking and photographing the impromptu car show run amok, only go to show that when rich people do dumb things in a big way, the masses are more than happy to snicker. This probably why they invented valets. When I think about Valet parking all I can remember is Farris Buler's Day Off. The 2 guys taking Camron's dad's car for a joy ride lol. Yes, classic. Why I never valet any of my cars. I'll still pay them, but I park it. Quite sweet! There was a style back then that's missing from today's cars. I was walking in a parking lot yesterday and looking at the headlights of cars as I passed them and I can't tell the difference between a Buick and a Toyota anymore. Design innovation is definitely missing right now. Yeah they are all going for aerodynamics. They all seem to think that completing this goal means they all have to look the same. If the requirements of the vehicle are the same and the efficiency demands are the same, they're going to end up alike since the solution to the problem doesn't have much variance. But there's so much that can be done with tail lights and head lights to distinguish one marque from another. I just see no one trying. Well, besides Audi. Last edited by Samir; July 29th at 01:30 PM. Well you got a few, but it's like the Camaro and Charger, granted they are completely different but the same way the front ends are done with the sunk in headlights. I actually seen them both one behind the other looking from the side and the body design is almost simular, especially the way the back 1/4 panels are done. It seems like the Mustang went on it's own. This is why the Mustang v6 destroyed Dodge and Chevy in both v6 and v8 in all aspects. The Mustang v6 was announced as the best performing "muscle car" for your money out of the domestic market. I think this was Car and Drive but I could be wrong, I know it was on Speed TV one night. The new Mustang is a very potent platform. At SEMA 2010, the number of modifications was most for the Camaro, then the Mustang, then the Challenger. I guess the position of the Mopars hasn't changed. I saw this a bit earlier... I was heart broken. If that was my car.... I would be more than furious. I would shred her license, and burn it in front of her. You a better man then me, I would've snapped. I have a bad anger issue, especially when it comes to my car . I would be more than furious. I would shred her, and burn her in front of her car.